How do solar hot water heating systems work? Solar water heating systems work by capturing sunlight and using it to provide a significant proportion of your annual hot water demands. Similar to the heat pump’s method of capturing naturally-occurring energy, solar water heating systems do this by circulating a heat transfer liquid between the solar collectors on your roof and the twin-coil hot water cylinder inside your home. 1. Solar collectors are mounted on or in your roof. When sunlight hits these solar collectors, energy is transferred to the heat transfer fluid inside the collector. This fluid is usually a mix of water and glycol (antifreeze), which prevents the solar water heating system from freezing. 2. Once the fluid inside the solar collectors reaches a certain temperature, the fluid is pumped to your twin-coil hot water cylinder. 3. The fluid passes through the heat exchanger coil within your hot water cylinder, delivering heat to the water in your cylinder as it goes. 4. The water – glycol mix then returns to the solar collectors to begin the cycle again. (Optional) Should the solar water heating system not provide enough heat, a secondary heating system will bring the hot water inside your cylinder up to the required temperature. There are two main types of solar collectors: Evacuated tubes and flat plate collectors. Both types have their pros and cons, so the one you choose will depend on you and your home. Evacuated tubes are often cited as the more effective – and hence they come with a larger price tag. On the other hand, flat plate collectors are much more versatile, since they can be fixed onto or set within your roof, and as such can be used in a wide variety of applications. What does a solar water heating system consist of? Solar thermal panels (or solar collectors): either evacuated tubes or flat plate collectors. Water – glycol fluid: this fluid transfers the heat captured in the solar collectors to your hot water cylinder. Twin coil hot water cylinder: This is a specialised hot water cylinder that has two heat exchanger coils inside. The lower coil links to the solar water heating system, and the higher coil links to the heat pump. Insulated pipework: flow and return pipes that run between the hot water cylinder and the solar collectors. Thermostatic monitoring equipment: When the fluid within the solar collectors reach a preset temperature, it is sent to the solar hot water cylinder. Simiarly, should the temperature within the hot water cylinder drops, the solar water heating system will deliver more free heat from the solar collectors to the cylinder. This ensures no free energy is wasted, and it also acts as a safety precaution to stop the solar collectors from overheating. System controls and generation meter: This will measure how much hot water has been generated, which dictates your income from the Renewable Heat Incentive. You can find out more about what is the Renewable Heat Incentive here. 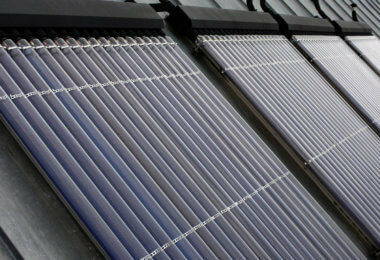 We design bespoke solar thermal systems to yield the maximum hot water production possible in any given scenario. To do this, we ascertain homeowner specifications, property orientation, layout etc. and as renewable energy system specialists, we will only specify parts that we can confirm to integrate seamlessly with the rest of the renewable energy system. This includes solar thermal collectors, solar hot water cylinders and its ancillary components. Using our in-house design calculation software, our proposals include informed estimates of annual hot water generation based on your roof’s tilt and aspect, shading properties and geographical location. You can make a balanced decision on whether to include a solar water heating system in your renewable energy system or not. Click here to find out how we can help you with your renewable energy system.